"The achievements and expertise Korea has accumulated in regulatory reform in the short period of the past 10 years will be shared with several countries around the world in the form of an official development assistance program,” said Choi Byung-rok, deputy minister for regulatory reform at the Prime Minister’s Office. Korea’s regulatory reform is the subject of intense international attention due to factors unique to the nation, including the way the Regulatory Reform Committee (RRC) is operated, he said. The RRC is a legally instituted organization under control of the president, but the committee, headed jointly by the prime minister and a civilian chairman, is composed of 25 members including 17 civilians and six members from the government. “The RRC has been credited with contributing to playing a part in overcoming the Asian financial crisis and the 2009 global financial crisis and helping the nation maintain sustainable growth,” Choi said. In reality, Korea posted one of the highest growth rates among OECD countries shortly after the global financial crisis. “We devoted ourselves to taking regulatory reform measures so that the economic recovery can lead to creating jobs and stabilizing the livelihoods of those in the low-income bracket” Choi said. 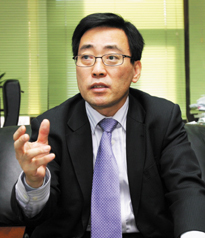 The following are excerpts of an interview between NewsWorld and Deputy Minister Choi, who touched on government policies on regulatory reform. Question: Will you tell our readers about achievements of regulatory reform made during 2010? Answer: We devoted ourselves to taking regulatory reform measures so that the economic recovery can lead to creating jobs and stabilizing the livelihoods of those in the low-income bracket. Specifically, we explored 1,037 tasks and revamped them for the purpose of boosting investments, providing support to low-income people and expanding future growth engines. The Prime Minister’s Office took regulatory reform steps to remove stumbling blocks for SMEs and agricultural and rural villages and lessen their financial burden. We overhauled regulations related to unreasonable educational discrimination of government agencies and public enterprises while revamping regulations that caused inconveniences to public life, particularly to small-sized shop owners, low-income people and foreigners. A total of 511 regulations had been singled out for regulatory reform candidates via public contests and other ways since last October. Out of the total, 142 regulations were revamped by the end of last year, and the remaining 369 are to be overhauled during this year. In addition, we’ve been redoubling efforts to elevate our regulatory reform foundation to advanced levels by completing an overhaul of unregistered regulations, expanding regulation sunset provisions and building a portal for regulatory information. A public satisfaction survey on regulatory reform, conducted by the Korea Chamber of Commerce & Industry last November, showed that the satisfaction index edged up 2.7 percentage points to 41.6 percent. Korea ranked 16th in the world, up three notches from 19th position in the previous year, according to Doing Business 2010, released by the World Bank last November. Q: Regulatory reform has contributed much to helping Korea overcome hardships, caused by the global financial crisis and boosting economic recovery earlier. Please explain the outcomes of regulatory reform in the economic field. A: Expectations on regulatory reform were high as people suffered hardships, coupled with the moribund economy in the wake of the global financial crisis that started in late 2008. At that time, extraordinary steps needed to be taken from the perspective of regulatory reform on top of the government’s fiscal stimulus steps designed to boost investments and create jobs. Preemptive institutional reform was badly required to brace for future growth engine industries in the post-crisis era. Here is a look at a few achievements of regulatory reform the Prime Minister’s Office and the ministries implemented at a fast and intensive pace. We introduced temporary regulatory relief (TRR), a system designed to halt or relax for a given period the execution of regulations until the economy turned around. Under the system, 280 tasks were implemented, earning a global reputation. Regulations on the development of the Seoul metropolitan area, which were stringent enough to stymie investments, were revamped. Regulations on small-sized plant sites were lifted as part of steps to rationalize regulations on land utilization, while regulatory reform was conducted on the permission of attracting foreign patients as part of steps to ease regulations on the service industry. We took steps to relax regulations on the financial sector, including raising the cap on non-financial companies’ stock holdings of financial groups from 4 percent to 9 percent, while continuously loosening regulations on military facility protection zones without hindering military operations. Our efforts to revamp regulations on the nation’s future breadwinner industries, including new and renewable energy, convergence of broadcasting and telecommunication, and green transportation systems have made headway. For instance, we took a step to allow the reuse of waste heat and waste steam into resources in June 2009, bringing about economic effects worth 174.3 billion won and reducing 120,000 tons of greenhouse gas emissions yearly. Q: Will you elaborate on the major regulatory reform tasks and goals the Prime Minister’s Office will carry out during this year? A: The government set five regulatory reform goals for 2011: invigorating investments, stabilizing public life, realizing a just society, bracing for the future and lessening the public’s burden, and it plans to implement regulatory reform in a fast and aggressive manner. To this end, the government held a reporting session on plans for the implementation of regulatory reform in 2011, presided over by Prime Minister Kim Hwang-sik, and determined 1,156 regulatory reform tasks to be carried out by government agencies. Out of the total, 100 regulatory tasks with bigger spillover effects will be handled by the Prime Minister’s Office. The government has decided to attach priority to the implementation of the 50 regulatory tasks that have direct impact on the creation of jobs. Thanks to these efforts, the government is striving to make sure to carry out core policy tasks, including the creation of jobs and 5 percent economic growth. Here’s a look at major regulatory reform tasks the Prime Minister’s Office will implement during this year. In an effort to boost investments, the government plans to take steps to promote the rationalization of regulations on sites that are now applied uniformly to such areas as nature preservation zones, to allow the construction of structures such as housing, public housing and accommodation facilities within commercial zones, and to lessen the minimum division size of sites within industrial zones for expanding the location of small-sized firms. Among regulatory reform tasks designed to stabilize public life and realize a just society are the projected relaxation of conditions for providing housing funds to newlywed couples and households with several children; the revamping of regulations on new entrants into such businesses as security and outdoor advertising; and the expansion of youth interns for SMEs. We will also overhaul unjust contract terms and articles of incorporation with public organizations to promote the cause of a just society. As part of steps to build a foundation for future growth engines, the government seeks to allow the use of low-frequency stimulation devices and other medical gadgets that have little impact on human health in beauty parlors; introduce a “Phase 0” study, designed to take place before a clinical Phase I study, to predict whether a new drug is viable for the next phase of testing as foreign countries do; and consolidate the certification of new electricity technology and new health technology into the existing New Excellent Technology (NET) certification system. We want to overhaul such regulations as the ones on the relaxation of the double classification of areas as urban natural park zones and development restriction zones; make the use of transportation fee cards available across the nation; build a one-stop system on checking and paying traffic violation surcharges and penalties; lower the highest interest rate on an act on lending from 44 percent to 39 percent; and enact a law on the protection of financial consumers. The government will continue to explore and implement these and other tasks designed to lessen the general public’s financial burden and enhance public conveniences. Q: Will you tell us about the background and missions of the establishment of the Regulatory Reform Bureau of the Prime Minister’s Office and the Regulatory Reform Committee (RRC) in 1998? A: Established in pursuance of the Basic Act on Administrative Regulations in 1998, the RRC is a legally institutional organization in charge of overseeing the nation’s regulatory reform under direct control of the president. The committee, headed jointly by the prime minister and a civilian chairman, is composed of 25 members, including 17 civilians and six members from the government. The RRC began in the form of the Administration Reform Committee and the Regulatory Reform Implementation Committee, established by the Kim Young-sam administration. The current RRC was inaugurated as a regular body under the Kim Dae-jung administration. Starting with halving the existing administrative regulations in the face of the 1997-98 Asian financial crisis, the RRC has taken the initiative in advancing the nation to global standards by enhancing the efficiency of the government and the autonomy of the private sector. The RRC has been credited with contributing to playing a part in overcoming the Asian financial crisis and the 2009 global financial crisis and helping the nation maintain sustainable growth. Here is a look at the RRC’s two missions. The commission’s first mission is to always revamp the existing regulations. In the beginning of each year, the RRC determines the regulatory reform tasks each ministry will have to implement and make regular checks for encouraging regulatory reform. Besides, the Regulatory Reform Bureau under the Prime Minister’s Office, the secretariat of the RRC, has selected pan-governmental regulatory reform tasks as strategic ones and has implemented them. Since the inauguration of the current Lee Myung-bak administration, we carried out a slew of regulation reform tasks, including temporary regulatory relief, regulatory reform in new growth engine fields, the overhauling of regulations related to educational discrimination and the revamping of food and pharmaceutical regulations from scratch. The RRC’s second mission is to restrict newly emerging regulations in a rational manner. The RRC reviews regulations that spring up or get reinforced, and if necessary, has them repealed or revamped, thus playing a role in making regulations top-grade ones. Q: Will you comment on mid- and long-term tasks? A: Despite diverse efforts, people say the Lee Myung-bak administration’s regulatory reform has yet to reach a level high enough to satisfy public needs. We’re redoubling efforts to carry out regulatory reform of core regulations and lump-sum regulations so that people can sense changes. Accordingly, departing from each ministry’s fragmentary regulatory reform, the RRC will accelerate its efforts to conduct an inter-ministry overall review of regulations from the mid- and long-term perspective from scratch, particularly centering on such areas as food and pharmaceuticals, education, financing and land utilization/development. Such government agencies as the Prime Minister’s Office, the Ministry of Health and Welfare and the Korea Food and Drug Administration (KFDA) have already gotten down to a review of regulations in the food and pharmaceuticals fields, and this will likely bring about tangible results soon. Regulatory reform in health/medical services, legal services and other areas directly linked to public life will have to be accelerated through social consensus for regulatory reform. The achievements and expertise Korea has accumulated in regulatory reform in the short period of the past 10 years will be shared with several countries around the world in the form of an official development assistance program. I recommend that the most important thing in regard to regulatory reform is a change in public awareness, even though the institutional overhaul of regulations in several areas is essential. I understand that so-called “paternalism” or “collectivism” pervades every nook of society, so the nation should break out of a vicious circle in which it allows each group its vested rights, leading to the government’s portioned regulations. For instance, the nail art area has already been established as an independent business arena, thus the government’s bid to inaugurate a separate qualification system was faced with strong opposition from the cosmetic business community. Another problem lies in how public demand is being mounted for the government to take steps to tackle any issue that comes to a head, forcing the government to produce transient regulations. The nation should have a firm belief in our society’s “self-purifying” power to solve issues on its own.